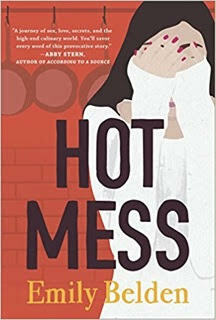 Twenty-something Allie Simon never imagined she’d fall for a recovering drug addict—but that was before she met Benji Zane, Chicago’s hottest up-and-coming chef, who’s known as much for his hard partying ways as for his unparalleled culinary skills. Six months into their relationship, the food and chemistry are out of this world, but the reality of living with a cooking wunderkind hasn’t exactly been all hearts and flowers. Still, Allie’s convinced that her love is the key to fixing this talented man’s broken soul—so when Benji is offered his dream job as chef de cuisine for a new restaurant opening on Randolph Street, Chicago’s foodie hot spot, Allie agrees to invest her life savings in his future. But less than a month after she goes all in, Allie learns a heartbreaking lesson: addicts lie. Benji cracks under the pressure, relapses and disappears, bagging out not only on the restaurant, but on her, too. Left with nothing but a massive withdrawal slip and a restaurant that absolutely must open in a matter of weeks, Allie finds herself thrust into a world of luxury and greed, cutthroat business and sensory delight. Lost in the mess of it all, she can either crumble completely or fight like hell for the life she wants and the love she deserves. I will admit that I have a soft spot for food writing. I don't read it as often as I would like, but almost always enjoy it. This novel isn't exactly foodie fiction, it is much more in the restaurant realm, but it still hit the same notes for me. The set up is one that is familiar--a young woman is blinded by lust and ends up holding the bag when the object of her affection falls. I found Allie to be a believable, for better or worse, character. I also found her to be very true to her age. She's only in her mid-twenties and it shows, especially in some of her decision making. Don't get me wrong, some of it was definitely cringe-worthy, but it was appropriately cringe-worthy. It is not a surprise that this book is mostly predictable, but it is also a case where predictability works in its favor. The reader knows where Allie is headed long before she recognizes it and the resulting feeling of dread is a driving force in the experience of reading this novel. Yet, in all this, the reader can recognize Allie's bad decisions, but still understand them. If I just thought Allie was an unrealistic idiot, I don't think I would have made it 50 pages in. Belden took on a tricky dish with this one because there are two distinct parts to this book: Allie and Benji and then Allie cleaning up the mess Benji made. In my experience, it is far too common for books that are structured like this to seem fragmented, as if there are two separate stories going on. Here, however, the the two acts fit together snugly, yet the fact that there is two parts enhances both. We have Allie before and Allie after. I did have a minor quibble about this book. I wish that Allie's relationships with her parents and with her two girlfriends were more deeply explored. It seemed strange to me that these characters were pretty much kept in the background when they were the constants in Allie's life. I think that, had they been more fully integrated into the story, we'd get a deeper picture of who Allie was. All in all, this was a fun read that kept me going from the first page to the last. If you are looking for something with a bit of urgency, but still a lot of entertainment value, this could be the book for you. Emily Belden is an author for powerhouse publisher, Harlequin/HarperCollins. She is represented by famed literary agency, Browne & Miller, along with 44 Blue Productions in Burbank. The SoCal studio is adapting her memoir into a comedic series. You can connect with Emily at her website, on Facebook, and on Twitter. If you would like to read more about this book, please visit some of the other stops on this blog tour.